Models in this series provide an ergonomic seating solution in a variety of workplace and learning spaces. Cloth and vinyl upholstery styles available to match various workspace requirements. 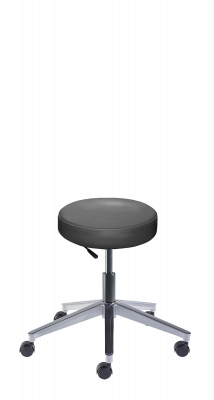 Round seat with high-resilience molded foam cushioning and internal seat board bumperguard. Pneumatics are available to provide low, medium and high seat height ranges to accommodate many task requirements. Black powder-coated paint fnish standard on metal parts. High-profle Euro-look base with T-shape construction for added strength and easy cleanability. Dual-wheel non-marring polyurethane casters resist movement when the chair is unoccupied, enhancing workplace safety by inhibiting seating from rolling away. Easily create the custom configuration you need.